There are a lot of parts that can be upgraded to improve performance or that might need replacing after you’ve used a rifle for a while. You might tinker with triggers and swap out safety selectors on a fairly regular basis, but how often does your buffer spring really cross your mind? It’s time it did. Strike Industries AR-15 flat wire buffer spring is the drop-in improvement you’ve overlooked for too long. AR-15 buffer springs tend to be something of a weak link in the weapon system. Over time the OEM springs weaken, and can fail, bringing the service life of your rifle to an abrupt end. Strike Industries’ AR-15 flat wire buffer spring is made from 17-7 steel that has been cryo-treated to last longer and perform more reliably than its predecessors. The space between spring arcs is larger, and will not compress with use. You’ll enjoy more consistent performance, increased bolt load and much smoother cycle than with OEM springs. The flat wire buffer spring controls harmonics and vibration allowing the shooter to get follow-up shots off more quickly. Not only is AR “bounce” virtually eliminated, but the irritating “twang” so many shooters complain of is a thing of the past when you use this AR-15 buffer spring. 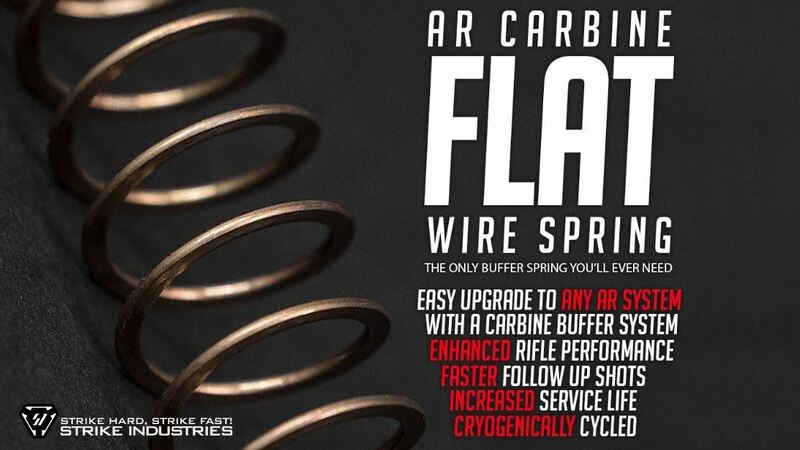 Whether you’re building a new system or just looking to replace a worn AR-15 buffer spring, the Strike Industries Flat Wire AR Carbine Buffer Spring is the only buffer spring you need to consider for your standard length AR build. Not only does it outperform OEM springs, but it does it without breaking the bank. Got this spring for wife's very first MSR (300BLK). Recoil nearly nonexistent. Happy wife, happy life! Bought a brand new round spring to replace worn spring. Noise was horrible. Ordered the flat spring from Wing Tactical. It was everything they said it was. QUIETER, and fast shipping. Excellent upgrade to the milspec buffer spring. No sproing noise! Very noticeable going from my pistol with the flat wire to a stock M&P15. Super happy with the purchase. They will now go on all of my builds! It really does perform better than the standard round wire spring. Won't cook breakfast for you, but it does cycle more reliably. And you don't get the "twang" noise of the stock spring. Not that that was ever a deal breaker for me with the old one, but it's just that much nicer. The perfect addition to my lower build! Going to get another one for my 2nd AR!!! After limited use, I like it. I have only used this spring for a few hundred rounds so far so, long term issues such as durability and "set" are not considered at this time. I got this to replace an Armaspec SRS which I was not too satisfied with. In all fairness, I got the "Heavy" Carbine version and would like to try the "Standard" Carbine instead. Unfortunately, the folks at Armaspec don't seem to have their act quite together so I've been unable to get the lighter buffer weight for my spring. As far as the Strike Force Flat Spring, there were no feeding or ejecting problems encountered with the rounds fired. It functions smoothly and without the characteristic "twang" of the standard spring, not that I really cared about that. When operating the BCG manually, I could not tell any difference between actuating this spring and the stock spring (unlike the Armaspec which is what REALLY annoyed me about it). I could tell no difference in felt recoil between this spring and the stock spring (again unlike the Armaspec which I do believe actually reduced felt recoil a bit). All in all would neither recommend nor not recommend this spring. If you are in the market to replace the spring you currently have, this one is certainly worth consideration. As other reviewers noted, this spring immediately makes a difference in the feel of your BCG slamming home, it does so now with authority! I do believe it will make the carbine run more quietly too, especially since I've paired it with the Nickel-Boron coated buffer tube by WMD guns. Running the action with both parts installed was silky smooth. Would buy again. These springs are in all three of my AR platforms (16" 556, 12.5" 556, and a 9" 300 blk) and The improved bolt load alone is worth it. It is subtle but you will feel the action smooth out both charging manually and during firing cycle. The benefit of the twang dampening is icing on the cake. $17 at + WT fast reliable shipping and no regrets.